I really like Kidorable brand rain gear. As the name suggests they are for children and are just adorable. You can get matching rain boots, umbrellas, and rain coats for your little one and have a variety of designs to choose from. They also have backpacks, towels, sun hats, and other accessories to match the popular rain gear themes. I know they hold up well. We used to pass my daughter's on to her cousin when she grew out of them. They lasted long enough to be passed down again to her little sister. Little girls and boys love Kidorable because they are fun! The designs are really creative and there's something for everyone. I don't think there is a style that I haven't liked. They can be hard to find in stores so shopping online may be your best bet. This page will break down all of the different themes for boys and girls and allow you to easily scroll through them all to find one that you like. All ensembles include an umbrella, rain coat, and rain boots. Most collections also include a matching backpack, hooded towel, and clothing hanger set. Depending on the style you may also find T-shirts or coordinating knitwear including a hat, scarf, and mittens. There are also a few bookends to bring a favorite pattern into their room. Umbrellas measure 24" long and open to a 27" diameter. Rain coat sizes start at 1T (12-18 months) and go up to a 6/6X. Rain boot sizes start at size 5 (EUR 21) and go up to up to size 2 (EUR 32). To purchase any item from of these collections let me direct you to the Kidorable website where you will be able to choose the products in any size you need. You can buy individual pieces or a set. These are no longer promoted on the Kidorable website. You can still find some on their outlet store page, as well as on Amazon and eBay. Availability is limited. I'll link to a few for sale below. Yellow and Black with a touch of White. This bee umbrella was one of the most popular Kidorable designs in their early days. The yellow stripes could put some cheer in the dreariest of days, and the bee's wings on top have to make you smile. Light and Dark Pink with a touch of Black. These pink cat rain boots were the first Kidorable product my daughter had. I think we ended up getting them in a few different sizes as she grew out of them. They are light pink rubber boots with dark pink details and a kitten face painted the toe of each boot. It has a red nose and red bows on it's ears. Three shades of Blue with a touch of Red. More than just rain gear, your little one can don Kidorable when the sun is shining too. I think this blue dolphin cotton sunhat is perfect for a beach day. 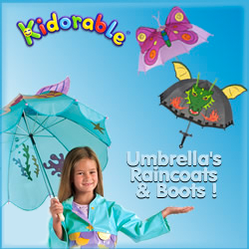 Kidorable has three different English Roses rainwear lines that were inspired by Madonna's best selling children's book The English Roses for ages 6-9. It's a story about making new friends and dealing with new social situations. A very excited Mom and her adorable daughter show us their new Kidorable gear.